“We’re not talking here about literally vanishing from the world and its future:--no escape backward in time to paleolithic “original leisure society”--no forever utopia, no backmountain hideaway, no island; also, no post- Revolutionary utopia--most likely no Revolution at all!-- [...] no anarchist Space Stations--nor do we accept a “Baudrillardian disappearance” into the silence of an ironic hyperconformity." The former as presented by Easterling, falls under what she terms extrastatecraft, or infrastructure that allows unreported profit-driven activities to occur. Infrastructure in the way it is used here refers not only to physical networks such as roads, trains, and urban grids but more particularly to the regulations that give birth to these networks. More specifically she refers to key zones where said regulation is relaxed in order to incentivize economic activity and attract foreign capital. These incentives include tax havens, improved services like electricity or broadband, relaxed construction laws, suspension or relaxation of national labor laws and environmental regulations, and outlawing of labor unions and strikes. The urban manifestations of these regulations have historically included or currently include freeports and processing zones near ports and airports, science industrial parks, internet cities and digital districts, and most recently education cities and green cities. I concede that putting the two together and attempting to forge a theoretical amalgam may strike an odd note. Not only can the two terms be traced back to diametrically opposed ends of the political and economic spectrum, from anarchism to libertarianism, but they are also radically different in terms of their existence. One is a poetic and militant speculation of a form of collective living, distributed in a sparse scattershot across historical time and space, whereas the other is a powerful actually existing economic tool in the service of national economies and private capital. What they both perform however, whether through theory or hard praxis, is disdain for the nation-state paradigm. The TAZ does this by rejecting the laws and social relations that occur in the nation-state proper, retreating into discrete enclaves of isolation that may verge on primitivism. The SEZ however takes the other route outwards towards the extralegal, via the unhindered flows of multinational capital. I am interested in interlacing one into the other in search of a viable conceptual basis for the project’s organizational and architectural fiction. By that I mean I wish to fuse the formative ambitions of a traditional Temporary Autonomous Zone, a self-proclaimed alternative community aspiring to retreat and divest from the state and private institutions in some capacity, with the legal and economic framework of a Special Economic Zone benefiting from recognized tax havens and other incentives. The reason I look towards the SEZ as a concrete economic tool for the foundation of the narrative is my rejection of the romanticization of primitivist and separationist communities, both real and imagined. I believe that the networked reality of power makes it impossible to imagine achieving a semblance of autonomy by mere spatial retreat. The intent of the proposal is thus to critically repurpose this economic tool to ends that are radically different from those usually listed as items on the agenda such as promoting foreign investment and establishing a level playing field for corporations in the local economy to compete at an international level. Rather, the aim here is to situate the founding organization of the architectural object at the point of rupture of the Special Economic Zone where capital is funneled outside of the business-as-usual loop of state taxation on private for-profit institutions. But in lieu of the usual scenario where the founding entity consists of a group of private for-profit corporations seeking a larger margin of economic return by eluding state taxation, the narrative here proposes a non-profit managing body whose raison d'etre is to create a web of activities that are mutually dependent, self-sustaining, and provide services locally that are otherwise partially or completely not provided by the state and private institutions. Thus, the location of these activities in a Special Economic Zone where debt to the state is lessened or eliminated is in an effort to repurpose that margin into productive services made accessible to a public that consents to aligning itself with the founding organizational body. It is at this point that the project becomes a polity. An art freeport is a Special Economic Zone where art pieces are stored when they are not on display, where it is more readily acknowledged that human artistic input is a market-valuable asset. Art pieces in art freeports are specifically those that are priced above a threshold point where it becomes more cost-effective to ship them overseas to be stored in a tax haven. a means to represent a culture, a nation, money, or anything else. Even the duty-free art in the freeport storage spaces is not duty free. It is only tax-free. It has the duty of being an asset. 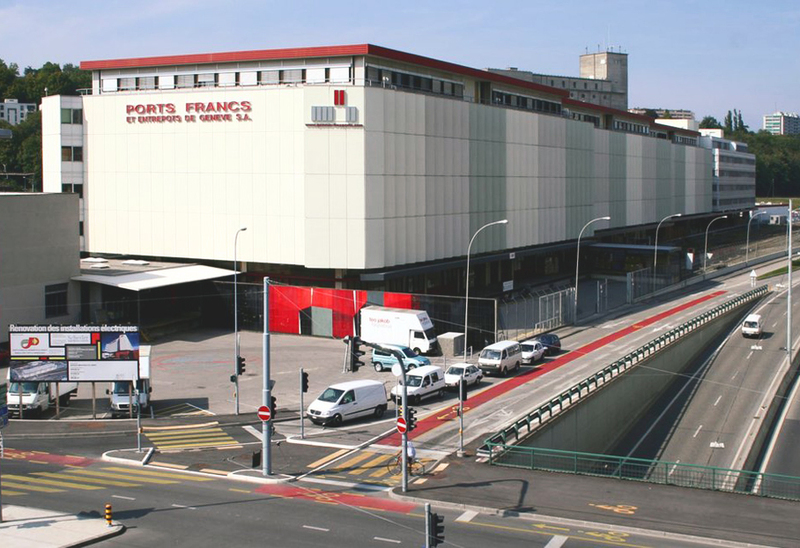 The prime example of a contemporary freeport frequently headlining art news websites and shrouded in an air of intrigue with its recurring scandals is the Geneva Freeport. The simplicity and bland corporate identity of its website belie immense numbers and vast power networks; the warehouse complex reportedly housed around 1.2 million works of art in 2013. Its collection led Jean-Rene Saillard of the Fine Arts Group to claim that the Freeport would be “the greatest museum in the world” if it were indeed a museum. Recently, the Geneva Freeport and other such institutions have made into onto the radars of art historians and theorists interested in studying how special regulations and market forces related to freeports influence the production and circulation of art. These include Berlin-based filmmaker and artist Hito Steyerl and art theorist Stefan Heidenreich who has gone so far as to coin the term ‘freeportism’ in reference to the mode of representation spawned by the rise of freeports. Heidenreich’s belief is that freeportism causes art to be produced in a manner that gives priority to its ability to circulate through social media by way of attractive photographic representation, allowing it to recede into the “wooden boxes” of freeports while still proliferating online in a way that encourages investment and allowing its value to appreciate meanwhile. Here, I would like to argue that the art freeport has evolved into a definite architectural typology with an extractable set of features that are fully justified by the economic functions that the freeport must play. This evolution is best illustrated by comparing the recently erected Le Freeport in Singapore and the Luxembourg Freeport to their primordial ancestor, the Geneva Freeport. The Geneva Freeport facility was not originally conceived as an art freeport and continues to house high-end goods which are not art-related. Its design has been described as perfunctory and staid; this holds true for both its exterior and interior. 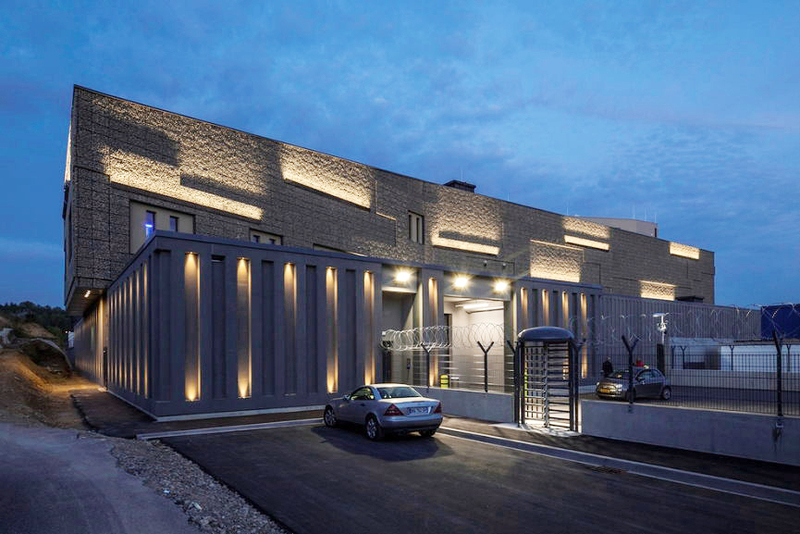 From the exterior it is an unembellished rectangular box with repetitive façade elements and unremarkable materiality. Documentation of the interior experience of the building is lacking as it is not designed to accommodate visitors/buyers of art. Upon comparing to the two younger freeports, one registers a discrete shift in function and a newfound investment in aesthetics. These two are premised on the idea that the purchase of art could happen on-site, and that this transaction must reiterate the elevated status of both the transactors and the commodity itself by being a fully designed experience. This experience is at the center of what is now a highly aestheticized and affective building typology. It begins with a private shuttle service from the adjacent airport/train station, extending the tailored experience from the premises of the building and plugging it into its transnational infrastructure. After passing through on-site security, the visitor is ushered into a central atrium space with a dominating architectural element or artwork/sculpture. In the Singaporean installment, this is Ron Arad's "Cages Sans Frontiere"; in Luxembourg it is a mural by Portuguese street artist Vhils. The purpose of embedding art into the venue itself is along the lines of reasserting the status of the institution as purveyor of artistic taste and selection. The visitor is then given access to a series of viewing suites, arranged among the storage units. 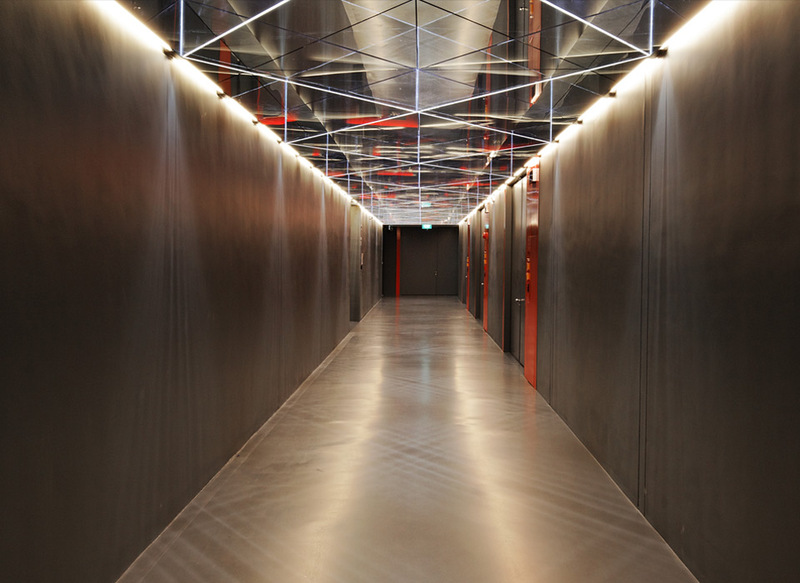 Even circulation space is lit dramatically and treated with high-grade materials such as polished metal. Watching the official walkthrough video of the Singapore facility, one is excused for misplacing it among blockbuster concept art for its high-caliber cinematics and overlaid musical score. Such is the singular status of the art freeport: it exists as an extension of logistical services, exacting security, and highly technical building standards into the realm of aesthetics, both in terms of the contained artifacts and in terms of the architectural expression and experience. Steyerl begins a paper called “Duty-Free Art”, by asserting that “contemporary art creates new physical spaces that bypass national sovereignty,” before surveying examples from the art freeport to art galleries turned refugee shelters. She resolves at the end with a complex metaphor derived from a personal dream that consists of contemporary art acting as a two-sided screen that can both increase or decrease the visibility of inequality, injustice, nation-states at war, etc. She supposes that the “secret museums” manifested in freeports such as the Geneva Freeport are one side of this screen, and that the idea of “duty-free” art, or art that is not tied to the nation-state cultural model, should be pushed even further. The idea of duty-free art recalls earlier debates about the autonomy of art and the the artistic process from their conditions of production  which have historically been centered on the artist and her subjective input into the artistic process. However, centering the debate around the artist proves inconsequential if we must resign ourselves to the fact that under the current order, artistic output will continue to be commodified and assetized. Perhaps a more immediate hacking of the system can occur at the node where the artefact has already become an asset: what if market-valuable duty-free art, or art that does not pay its dues to a state or a profit margin, were to fund autonomous economic structures dedicated to inclusive welfare? This section, as stated before, aims to form a synthesis out of the extrastate regulations of the free zone, and the formational intentions of the TAZ. The art freeport as an example of a free zone will serve to inform a definite storage component of the project: an art freeport that is aware of its status as an autonomous zone, and one that is dedicated to the storage of artistic output. The envisioned organization behind the project may include a body or group of individuals managing the not-for-profit freeport, allowing it to acquire, store, and trade in tax-free art. In actually existing instances, freeports do not exhibit the stored art since that may interfere with the strict market forces of the art trade. A programmatic concern that will have to be tackled architecturally is the creation of a framework where the works of art can be made public in some capacity, allowing a museum function to exist as an extension of the warehousing activity and the general program. The projected outcome is an art-dedicated program where art is stored, made at least partially viewable to the public, and where it can be sold or auctioned off as part of a larger economy that involves non-art related activities. An interesting opportunity that presents itself when considering the art museum that is born out of a freeport is in the question of curation. The objects and artworks entering the transnational webs of the art market and passing in freeports are by default those with proven market value and more-or-less assured long-term returns. This embeds the freeport-museum with a selection bias that is dictated by strict market forces: any art on display here is market-valuable asset. This asset passes or is stored at this point in time and space only because it is profitable for it to do so: the art on display is by nature tethered to the webs of transaction that are in geographic proximity. It is within the range of these parameters that the freeport-museum's agency to curate can be practiced. Instead of working against these limits, the curation agency could embrace these parameters as the structuring principles of the curation effort: curation by the geographic confines of profitability, curation by political economy. The museum becomes a visualizer of the status of art as an asset continuously in flux and alternating between periods of transit, public display, and private ownership. Sellars, S. (2010). Hakim Bey: Repopulating the Temporary Autonomous Zone. Journal for the Study of Radicalism 4(2), 83-108. Michigan State University Press. Sargent, L. T. (2008). Contemporary Political Ideologies: A Comparative Analysis. Cengage Learning. Chicago. Bürger, P. (2011). Theory of the avant-garde. Minneapolis, MN: University of Minnesota Press.